Unfold the pastry sheet on a work surface. Trim the pastry sheet to fit the waffle maker, if needed. 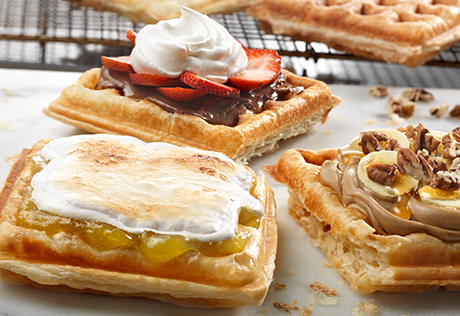 Place the pastry sheet into the waffle maker and close the lid. Cook for 8 minutes or until steaming stops and the waffle is golden brown and crisp. Cut the waffle in quarters. Spread each quarter with 2 tablespoons hazelnut chocolate spread. Top with the strawberries and whipped topping. Alternate Preparation: For waffle sticks, cut the pastry sheet into 6 (about 1 1/2-inches wide) strips. Place into waffle maker and cook as directed above. Flavor Variation: You can also try peanut butter topped with sliced banana, honey and chopped pecans or lemon curd topped with marshmallow cream and broiled until the marshmallow cream is lightly browned.